The solar plexus chakra is located right above the navel and just below the sternum. 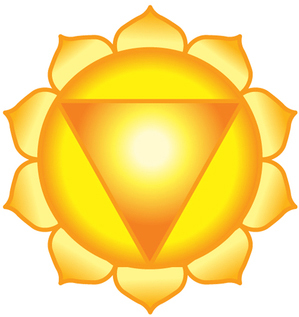 The color associated with this chakra is golden yellow, and it is the energy center where ego resides. Solar plexus is the source of your personal power, self-worth, and self-belief. When the solar plexus chakra is balanced, you have the courage to walk through your fears, speak up for yourself when needed, and you exert will power and self-control more often. In such situations you notice higher energy vibrations, tall posture, and a firm voice. It is noted that the successful people around us always stand tall, they speak with confidence, and conviction looking others straight in the eyes. Balanced solar plexus chakra gives a sense of self-mastery, NOT control over others; The difference is big. On the other hand, when the solar plexus chakra is weak or blocked we tend to become more disappointed, and frustrated, feeling as victims most of the time, our expectations lowers, and we experience a lack of self-confidence. Here are easy tools that can help you work on your solar plexus chakra. As in all meditation techniques, sit comfortably, and make sure not to be disturbed for at least ten minutes. Start breathing slowly, and deeply. Feel your body parts relax as you breathe, let your feet relax, let your legs, your hips, and torso relax. Let this wave of relaxation move up your spinal cord relaxing all muscle groups in your back, feel the relaxation wave move your abdomen area, and then slowly going up your chest relaxing all muscles, and organs in that area. Allow the wave of relaxation to slowly move to your shoulders, neck, and head, then feel it on your face, let it relax all muscles on your face, feel this wave of relaxation taking over your whole body until you are completely relaxed. Now that you are relaxed, bring your awareness to the solar plexus center, feel the energy spinning there. Imagine, and feel a shining golden sun expanding from the solar plexus. Feel the warm rays of this shining sun on your body. Let this warm wave expand to fill your whole being. Feel how powerful you are, how successful you are, and how confident you are. Remind yourself by affirming that you are powerful, confident, and successful. Continue to say the affirmations until you completely feel them. For those who find it hard to meditate on their own, below is a guided meditation for the solar plexus chakra, as always, if you do not find this meditation useful, please try to find other versions on Youtube, you should be able to find many. Beside meditation, it is important to practice self-mastery to maintain a healthy solar plexus chakra; and also, a much better life style. Always look people in the eye when you talk to them, maintain a smile on your face, dress sharp at all times. Make sure to walk tall, keep your back straight, walk faster. Practice speaking up for yourself when you need to, this can be challenging at first, but if you do it once, it become pretty easier, just do it ONCE. If you stick to those practices on daily basis, your self-confidence will build up, and you will enjoy a very strong solar plexus chakra. Essentials oils are amazing especially when used during meditation, and are known to work wonders. elemi, frankincense, angelica, vetiver, cedarwood, rosewood, rose, neroli, helichrysum, and myrrh oils are known to help purify, and balance the solar plexus chakra. Essential oils can be used in the form of scented candles or in candle or electric diffusers. Essential oils can be used in many different ways, check out how to use essential oils effectively for more information. Pasta, cereal, rice, flax seed, sunflower seeds, and other granola, and grains are known to help purify the solar plexus chakra; also dairy products like milk, yogurt, and cheese are very beneficial to this energy center. Some spices are very powerful when it comes to purifying the solar plexus, and those are ginger, peppermint, melissa, cumin, and turmeric. The most common physical feeling that people usually report is the feeling of butterflies in the solar plexus area. Others also experience tingling, vibrations, and energetic flushing sensations above the navel area.